Learning by Questions, the new cloud-based teaching and learning tool developed by the founder of Promethean Tony Cann, is under scrutiny from over 100 teachers in schools across 10 local authorities in the UK. 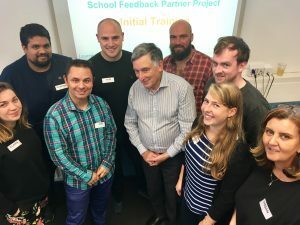 Launched this month, the £1million Feedback Study involving 50 schools in 10 local boroughs, is the culmination of 10 years of pedagogical testing with guidance from the Institute for Effective Education. Independent research shows that Learning by Questions could boost learning by more than 25% and the next 12 months will be used to fine tune the programme for teachers using it in the classroom. Learning by Questions can be used in a variety of subjects though the Feedback Study focuses on maths and the new mastery approach to which the Government committed £41million in 2016. Roshan Bapapulle, the Maths Leader at New Regents College, a Pupil Referral Unit in Hackney, said: “We’re moving towards technology. Learning by Questions frees us to plan better lessons and explore concepts or misconceptions in greater depth. “Unlike other packages that claim to ‘provide rapid feedback’ to students, LbQ empowers teachers to do just this through a personalised and non-generic process. The software is designed to alert teachers to misconceptions and difficulties as the students face them, allowing for very early intervention to be delivered. Currently undergoing a £1million Feedback Study with 50 schools in 10 local authorities across the UK and with a Beta Testing Programme to be launched in January, Learning by Questions is committed to improving education through evidence based pedagogy and will be launching in Autumn 2018.